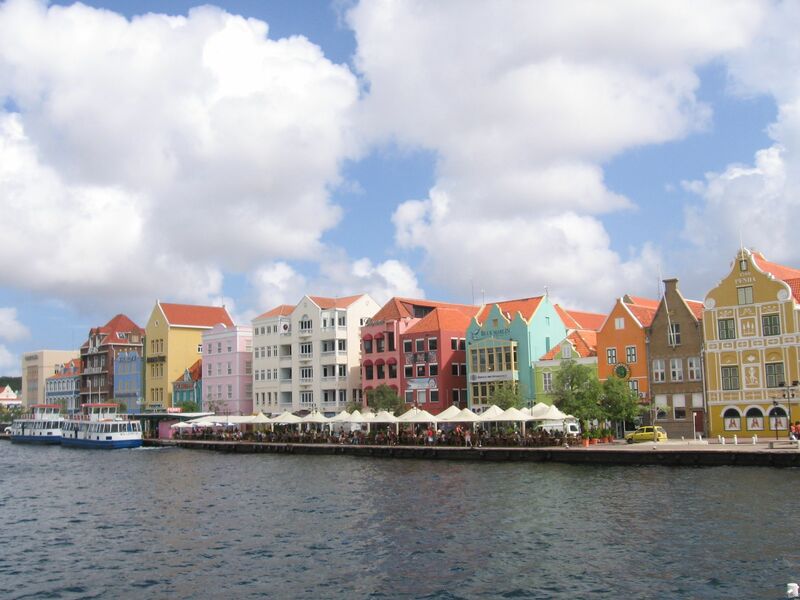 Just to the west of Bonaire is the island of Curacao (pronounced Kew-uh-so), the biggest island of these former Dutch colonies in the south Caribbean. It is about forty miles long and averages about five miles in width. It is also likely the most vibrant: populous (it has over a hundred thousand people), prosperous and probably the place to be down here. There are four languages spoken on Curacao: Dutch, English, Spanish and the native language, which is a mixture of all of the above plus Portuguese. They borrow words from each but over the course of time many have been been bastardized. That’s a lot of languages for the populace to learn, which is why people born here have to learn all of them except Portuguese. This has some great advantages. Residents are fluent in multiple languages, probably unlike any other country on the globe. Tourists can usually speak and be understood. All that linguistic fluency also facilitates commerce. A lot of commerce passes through Curacao. It makes a compelling destination not just for tourists but for anyone passing through the Caribbean. The Middle East has Dubai. Although smaller, arguably, Curacao is the Dubai of the Caribbean: it is its center of life, commerce and culture. So it’s interesting to stand at a street corner in Curacao for a while and hear the various languages spoken around you. Most of the signs are in English, although many are in Dutch and some are in Spanish. English is a practical choice for most signs because it is the world’s de facto global language and also because the oversize presence of the United States in the Caribbean. As in Bonaire, the U.S. dollar is the currency in use and it is used to price everything. 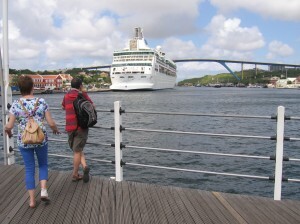 American tourists will feel completely at home in Curacao. There is a Starbucks near the cruise terminal, but also McDonalds, Burger King, KFC, Subway, Pizza Hut and many other American brands. And yet Curacao is still exotic. 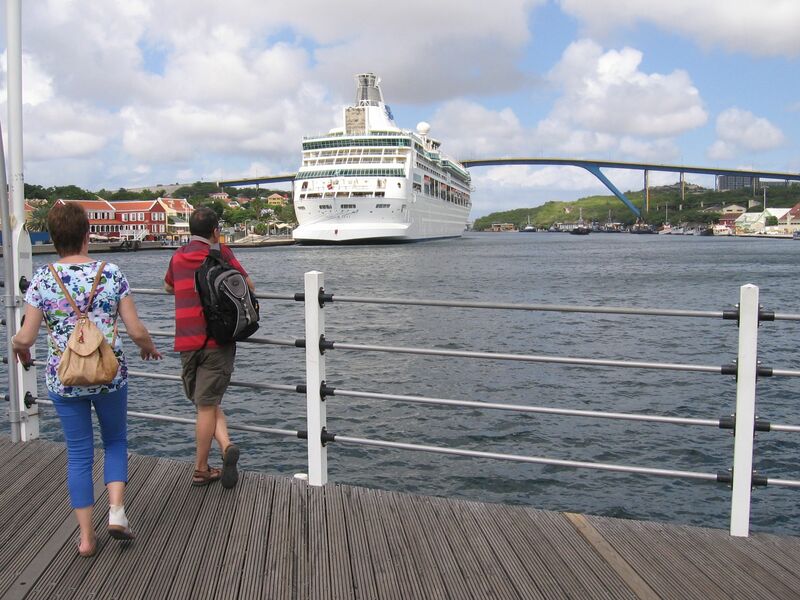 Take the Punda, a shopping district along a shipping canal in Willemstad, the chief city and the country’s capital. The canal and the area around it is just a neat place to hang out. All sorts of colorful merchant houses line the canal and the area. What makes it exotic is its waterfront and its large open air vegetable market. At the Punda, you can also walk onto boats that carry vegetables and other items from Venezuela, about sixty miles away. Need something exotic, perhaps an exotic snake? Ask one of the vendors from Venezuela and they will arrange to deliver it in a subsequent port call. This is the kind of capitalism Ayn Rand would definitely approve of. There is a landmark of sorts in Curacao: the Queen Juliana Bridge that towers well above the canal, allowing large ships to get to the Parera, something of an inland bay but mostly the site of a huge oil refinery. The refinery is just enormous and you can’t possibly miss it. You can see its plumes of smoke from the refinery and bright gas flames from its vent stacks. These put out quite a bit of refinery smoke, most of which appears to drift out to sea. If there is a downside to Curacao, it is the refinery. It is like a bit of New Jersey was plopped down into the middle of the island. Still, the refinery is impressive to look at. Otherwise, Curacao feels a lot like home, just very tropical. There is elegant housing here. If you are a drug lord you can make yourself a nice home on a hill around here without anyone caring. All it takes is money. While still part of a larger Dutch commonwealth, Curacao is its own independent country, so it feels free to allow drug lords and offshore banks to make their homes there. It certainly doesn’t feel crime ridden. It feels safe and well managed. It also feels prosperous. It has poor residents too, but they at least they get treated decently, unlike in the United States. There is good subsidized housing available and if they stay there long enough they can buy the property for bargain rates of $6,000 to $10,000 from the government. I don’t think Ayn Rand would like this aspect of Curacao. Unlike the United States, which is just now catching up, national health insurance comes are part of being a citizen too. Any citizen of Curacao is lucky to live there. One other unique aspect of Curacao impressed me: a pontoon bridge that spanned the canal. It’s a pedestrian-only bridge. Most bridges have a draw bridge to allow water traffic through. This one swings horizontally. It serves a vital purpose of connecting two banks of the Punda. We had two activities to keep us busy and which also allowed us to see much of the eastern side of the island. In the morning we visited some caves inside limestone cliffs near the airport. We have toured many caves over the years and this one was no more impressive than the last one we toured in the Caribbean island of Jamaica. However, it was unusual as you had to ascend to get into it. Curacao is the result millions of years of coral reefs compression. In short, it’s made of limestone, basically compressed coral, that was slowly pushed up over so many eons. The caves were once underwater but now are well above the water. We also took in a sunset cruise, which involved a bus trip to Caracas Bai (Bay). 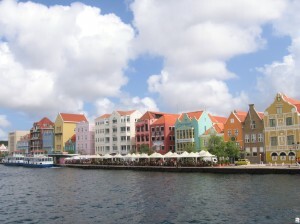 That area of Curacao is where the well-moneyed people and tourists live. There are lots of opportunities to enjoy life on the water. We saw sailboats and windsurfers, restaurants along the bay and five-star resorts. It looked like a good life indeed if you can afford it and you like a tropical climate. 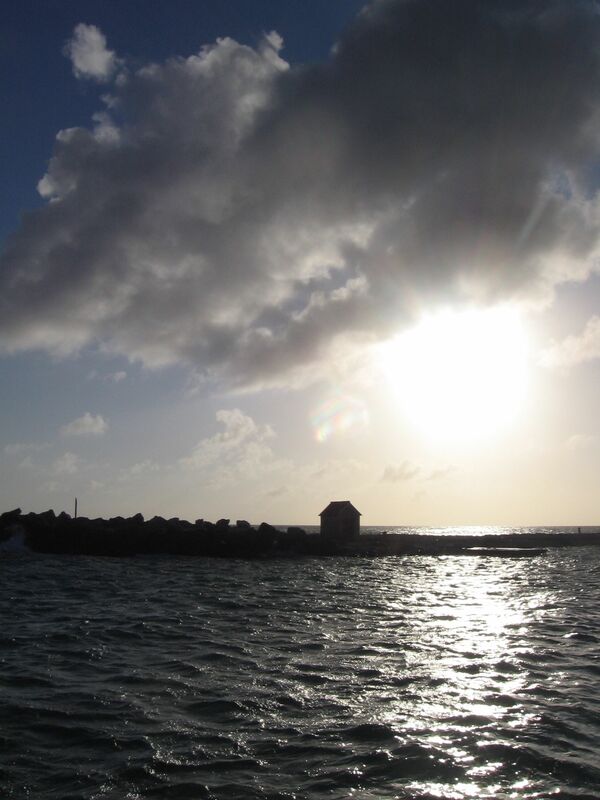 Like Bonaire, because of the coral reefs around this island, diving opportunities exist here too. The climate is about the same as Bonaire as well: dry and hot, although brisk winds today made being outside quite pleasant, despite the heat. Perhaps I missed them on Bonaire, but on Curacao it’s hard to miss the many cacti on the island. Our last stop is Aruba, just to Cucacao’s west, then a two and a half day non-stop cruise back to Fort Lauderdale, and then home where record cold and snow await our return. We might just refuse to get off the cruise ship.